Definition at line 61 of file util-radix-tree.h. Definition at line 64 of file util-radix-tree.h. Definition at line 77 of file util-radix-tree.h. 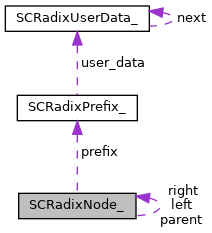 Referenced by SCRadixAddKeyIPV6String(), SCRadixCreateRadixTree(), SCRadixPrintNodeInfo(), SCRadixReleaseRadixTree(), and SCRadixRemoveKeyIPV6(). Definition at line 69 of file util-radix-tree.h. Definition at line 71 of file util-radix-tree.h. Definition at line 66 of file util-radix-tree.h. Definition at line 80 of file util-radix-tree.h. Definition at line 74 of file util-radix-tree.h. Referenced by SCRadixAddKeyIPV6String(), SCRadixFindKeyIPV4Netblock(), SCRadixFindKeyIPV6Netblock(), SCRadixPrintNodeInfo(), SCRadixReleaseRadixTree(), and SCRadixRemoveKeyIPV6().